In 1959 Impala Was Considered The "Upper Crust" Chevrolet With Identification Features Including Impala Nameplates And Crossed Racing Flags Emblems. Bth Identifiers Were Mounted Inside The Painted Insert Area Of The Full Length Side Trim Moldings, Below The Rear Side Windows. The Front Fender Ornaments Also Had Rear Extension Strips, Bright Metal Trim Marked The Deck Lid Center Crease And Taillamp Lenses. 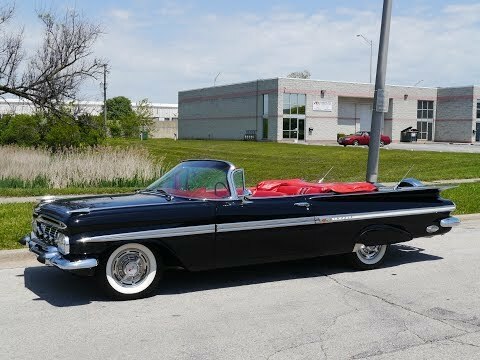 After the impressive Impala for 1958, it might seem odd that the Chevrolet never developed the styling concept further. No doubt they had plans, but those plans came to naught once designer Chuck Jordan who peeked over the wall and spied Chrysler's be-finned 1957 line. All GM activity came to a halt and a Plan B was instigated, a corporate-wide design of all-new cars for 1959. The winged '59 Chevys were the result. A “Slimline Design” they called it, with a “Spread Wing” tail, lit up with cat's-eye tail lamps. The nose had high horizontal vents, rumored to prepare the public for fluorescent headlights—an idea that never came to pass. Four-door hardtop sport sedans became “flat-tops,” with panoramic rear windows. In many ways, the convertible coupe was the most conservative of the lot, its gull-wing rear quarters tying nicely to the open cockpit. In the process of redesign the cars grew, an inch and a half in the wheelbase and an inch and three-quarters in overall length. Impala was now a series in its own right, eclipsing Bel Air, which was pushed down the market to the intermediate position. Further down the pecking order was Biscayne, now the entry-level model. The Impala line was short and sweet: a four-door sedan, two- and four-door hardtops, and a convertible. Drivetrain options were essentially carried over from 1958, with the addition of another fuel-injected small block and a high-compression, four-barrel 348. Transmission choices now included a four-speed manual, but not many full-size cars were so equipped. Close Inspection Shows An Exceptional Restoration To Highlight This Cars Impressive Features. An AACA Medallion On The Grille Evidences A Senior First Award In 1993.